Kings Cross 1981 by Cheryl Clark & Matt Berry. Blundells Emulsion. Travellers in the Kings Cross and Islington area must occasionally ask themselves why a set of flats has a mural advertisement for 'live family entertainment'. The mystery can now be solved! Step out and look at the building - it's an old pub - the Lord Nelson. On the side of the building is a Watney Combe Reid roundel - the sign for one of London's leading breweries in the 1930s. 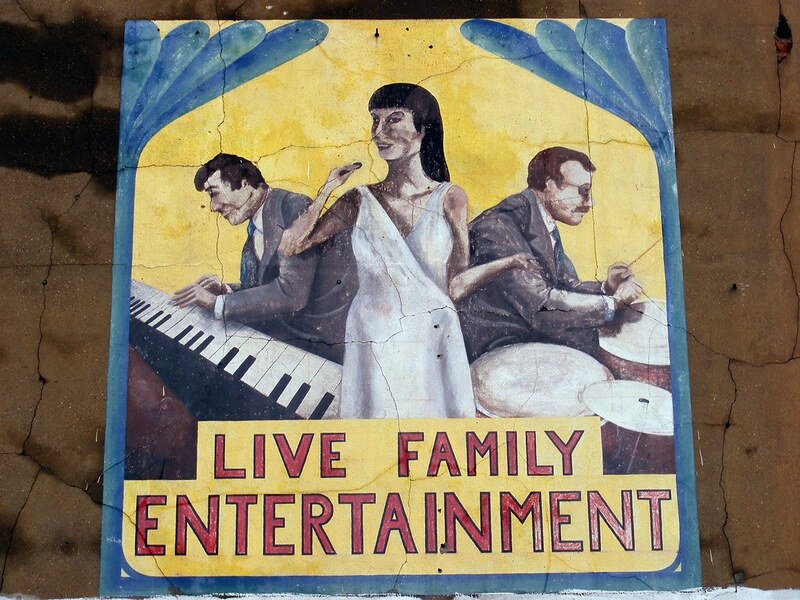 Around the side of the building we find the mural - a picture of a singer with accompanying musicians and the words 'live family entertainment' underneath. This art work was done in 1981 as part of Community Service Volunteers ' Operation 'Clean Up Islington' which had been responsible for several other pieces in the area including the Tolpuddle Martyrs Mural. Dave Bangs led the team and this work was executed by Matt Berry and Cheryl Clark. Their work could also be seen on the Market Estate off Caledonian Road. It is looking at these pieces that one can recognise their styles in this pub ad! So if you are wandering the area, go and find the sign and discover the only live family entertainment is you viewing the mural! There is some fading of paint and cracking of render. Exit Kings Cross Station by the main exit on Euston Road; cross York Way then turn left to head north up Caledonian Road. Walk over the bridge for the Regent's Canal, and keep on til you hit a main crossroad. This is Copenhagen street. Turn right and start walking. The mural should come into site on the side of an old pub now converted into housing.